MEGA64 BRINGS "RISE OF NIGHTMARES" AND PODCAST 192!! Today we are honored to present to you our newest video production- Our commercial for the new Kinect game "Rise of Nightmares" from Sega! There's never been a Kinect game like this... at least, in our dimension. But what about others? This BOLD and MYSTERIOUS video covers this very ground. If you're brave enough, check out our Rise of Nightmares video right now on Youtube in HD. Tell everyone you know about it! Note that because the game is rated M, the video is age-locked, so you'll have to actually be logged into Youtube to watch it. But that's easy, right? 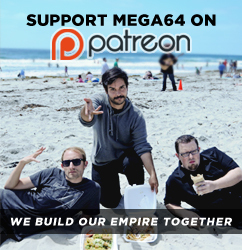 That brings us to the next portion of our site update- The Mega64 Podcast 192! We cover a LOT of lost time in this episode. You'll notice right off the bat that the video aspect of this new 'cast is wild- Shawn did an amazing job of editing it. If you watched us record it live last Sunday, you really owe it to yourself to watch it again. The second thing you'll notice is that the audio sounds a bit weird. It's because we're dumbasses and messed up the audio recording. We hope you'll forgive us. Watch it below. Audio version is here. Be sure to let us know what you think of our new Rise of Nightmares vid- And don't forget that Internet Soldierz shirts are still going strong on our online store! Get on it.